Diagramatic model of the Milky Way galaxy showing the location of the Sun. Galactocentricity is a cosmic center model which places our galaxy (the Milky Way) near the center of the universe. [W]e live in a galactocentric cosmos—a universe that has a unique geometric centre very near our own home galaxy, the Milky Way. ... Our galaxy is essentially at the centre of the cosmos, but not at rest with respect to it. This differs from geocentrism, which would have the Earth be at the exact centre and motionless with respect to it. In cosmology, the Copernican principle, named after Nicolaus Copernicus, states the Earth is not in a central, specially favoured position. In the earliest cosmologies, man placed himself in a commanding position at the centre of the universe. Since the time of Copernicus we have been steadily demoted to a medium sized planet going round a medium sized star on the outer edge of a fairly average galaxy, which is itself simply one of a local group of galaxies. Indeed we are now so democratic that we would not claim that our position in space is specially distinguished in any way. We shall, following Bondi (1960), call this assumption the Copernican principle. in which the universe is isotropic about every point in space time; so we shall interpret the Copernican principle as stating that the universe is approximately spherically symmetric about every point (since it is approximately spherically symmetric around us). It must be emphasized here that the Copernican Principle is a philosophical preference as opposed to conclusion compelled by observations. Further, one’s philosophy serves as the foundation for the framework within which one interprets observations; as such the Copernican Principle serves this purpose within mainstream cosmology - an operational assumption or axiom. The assumption of uniformity has much to be said in its favour. If the distribution were not uniform, it would either increase with distance, or decrease. But we would not expect to find a distribution in which the density increases with distance, symmetrically in all directions. Such a condition would imply that we occupy a unique position in the universe, analogous, in a sense, to the ancient conception of a central earth. The hypothesis cannot be disproved but it is unwelcome and would be accepted only as a last resort in order to save the phenomena. Therefore, we disregard this possibility and consider the alternative, namely, a distribution which thins out with distance. Both explanations seem plausible, but neither is permitted by the observations. The apparent departures from uniformity in the World Picture are fully compensated by the minimum possible corrections for redshifts on any interpretation. No margin is left for a thinning out. The true distribution must either be uniform or increase outward, leaving the observer in a unique position. But the unwelcome supposition of a favoured location must be avoided at all costs. Therefore, we accept the uniform distribution, and assume that space is sensibly transparent. Then the data from the surveys are simply and fully accounted for by the energy corrections alone - without the additional postulate of an expanding universe. The departures from uniformity are positive; the numbers of nebulae increase faster than the volume of space through which they are scattered. Thus the density of the nebular distribution increases outwards, symmetrically in all directions, leaving the observer in a unique position. Such a favoured position, of course, is intolerable; moreover, it represents a discrepancy with the theory, because the theory postulates homogeneity. Therefore, in order to restore homogeneity, and to escape the horror of a unique position, the departures from uniformity, which are introduced by the recession factors, must be compensated by the second term representing effects of spatial curvature. There seems to be no other escape. Note why Hubble favored the assumption of uniformity; it provided the only escape hatch from the implication that we occupy a unique, central position in the universe. Hubble found such an implication to be an unwelcome, intolerable horror that was to be avoided at all costs. In other words, he favored the assumption for purely philosophical (and emotional) reasons. People need to be aware that there is a range of models that could explain the observations,...For instance, I can construct you a spherically symmetrical universe with Earth at its center, and you cannot disprove it based on observations. ...You can only exclude it on philosophical grounds. In my view there is absolutely nothing wrong in that. What I want to bring into the open is the fact that we are using philosophical criteria in choosing our models. A lot of cosmology tries to hide that. However we are not able to make cosmological models without some admixture of ideology. Now at first sight, all the evidence that the universe looks the same whichever direction we look in might seem to suggest there is something special about our place in the universe. In particular, it might seem that if we observe all other galaxies moving away from us, then we must be at the center of the universe. There is, however, an alternative explanation: the universe might look the same in every direction as seen from any other galaxy, too. This, as we have seen, was [Russian physicist Alexander] Friedman's second assumption. We have no scientific evidence for, or against, this assumption. We believe it on the grounds of modesty; it would be most remarkable if the universe looked the same in every direction around us, but not around all other points in the universe! Thus, we see that the choice of which 'big picture' of the universe one picks is a philosophical issue. That being the case, those with philosophies differing from those of Hubble, Ellis and Hawking are free to reject the Copernican Principle. Assuming a galactocentric universe as a framework within which to organize astronomical observations is just as legitimate as assuming the Copernican Principle. As Ellis might say, there is absolutely nothing wrong in that. And God said, "Let there be lights in the expanse of the heavens to separate the day from the night. And let them be for signs and for seasons, and for days and years, and let them be lights in the expanse of the heavens to give light upon the earth." And it was so. And God made the two great lights—the greater light to rule the day and the lesser light to rule the night—and the stars. And God set them in the expanse of the heavens to give light on the earth, to rule over the day and over the night, and to separate the light from the darkness. And God saw that it was good. And there was evening and there was morning, the fourth day. Now the LORD God had planted a garden in the east, in Eden; and there he put the man he had formed. And the LORD God made all kinds of trees grow out of the ground—trees that were pleasing to the eye and good for food. Then God said, "Let us make man in our image, in our likeness, and let them rule over the fish of the sea and the birds of the air, over the livestock, over all the earth, and over all the creatures that move along the ground." So God created man in his own image, in the image of God he created him; male and female he created them. God blessed them and said to them, "Be fruitful and increase in number; fill the earth and subdue it. Rule over the fish of the sea and the birds of the air and over every living creature that moves on the ground." Then God said, "I give you every seed-bearing plant on the face of the whole earth and every tree that has fruit with seed in it. They will be yours for food. Then God blessed Noah and his sons, saying to them, "Be fruitful and increase in number and fill the earth. The fear and dread of you will fall upon all the beasts of the earth and all the birds of the air, upon every creature that moves along the ground, and upon all the fish of the sea; they are given into your hands. Everything that lives and moves will be food for you. Just as I gave you the green plants, I now give you everything. "But you must not eat meat that has its lifeblood still in it. For this is what the LORD says— he who created the heavens, he is God; he who fashioned and made the earth, he founded it; he did not create it to be empty, but formed it to be inhabited— he says: "I am the LORD, and there is no other. "But you must not eat meat that has its lifeblood still in it. And for your lifeblood I will surely demand an accounting. I will demand an accounting from every animal. And from each man, too, I will demand an accounting for the life of his fellow man. "Whoever sheds the blood of man, by man shall his blood be shed; for in the image of God has God made man. As for you, be fruitful and increase in number; multiply on the earth and increase upon it." To claim that man and the earth are nothing special is, at best, to blaspheme God as a liar or, at worst, to deny His existence. From a biblical perspective, all of creation is centered on man, in purpose if not in location. It would thus be perfectly consistent, though not required, if we were to find that earth is, indeed, at the cosmographical center of all creation - the universe. A rule in science and philosophy stating that entities should not be multiplied needlessly. This rule is interpreted to mean that the simplest of two or more competing theories is preferable and that an explanation for unknown phenomena should first be attempted in terms of what is already known. Also called law of parsimony. Adoption of the simplest assumption in the formulation of a theory or in the interpretation of data, especially in accordance with the rule of Ockham's razor. Then the data from the surveys are simply and fully accounted for by the energy corrections alone - without the additional postulate of an expanding universe. Had he applied this principal consistently, he might well have come to a conclusion different than he did. The fact that Hubble, by his own confession, fled the clear implications of his observations, gives the title of his work - The Observational Approach to Cosmology - a twist of irony. This is something we will see repeatedly in this article. There are many independent lines of evidence for which the simplest explanation is that we inhabit a galactocentric universe. Yet, time and again, mainstream cosmologists - following Hubble - insist on employing assumptions that, while unnecessary to explain the observations, are necessary 'to escape the horror of a unique position'. We have seen how different 'starting points' can lead to radically different destinations. It is very clear, from a biblical point of view, that earth and all that inhabits it, particularly mankind, are not just special, but extraordinary. Interestingly, all of the evidence we have corroborates the assertions of the bible; we have no empirical grounds for believing that earth and its teeming life are anything but utterly unique. What is the possibility of complex life existing beyond our planet? What determines whether complex life will arise on a planet? How frequent is life in the Universe? In this exciting new book, distinguished paleontologist Peter D. Ward and noted astronomer Donald Brownlee team up to give us a fascinating synthesis of what's now known about the rise of life on Earth and how it sheds light on possibilities for organic life forms elsewhere in the Universe. Life, Ward and Brownlee assert, is paradoxically both very common and almost nowhere. The conditions that foster the beginnings of life in our galaxy are plentiful. But contrary to the usual assumption that if alien life exists, it's bound to be intelligent, the authors contend that the kind of complex life we find on Earth is unlikely to exist anywhere else; indeed it is probably unique to our planet. With broad expertise and wonderful descriptive imagery, the authors give us a compelling argument, a splendid introduction to the emerging field of astrobiology, and a lively discussion of the remarkable findings that are being generated by new research. We learn not only about the extraordinary creatures living in conditions once though inimical to life and the latest evidence of early life on Earth, but also about the discoveries of extrasolar planets, the parts Jupiter and the Moon have played in our survival, and even the crucial role of continental drift in our existence. Insightful, well-written, and at the cutting edge of modern scientific investigation, Rare Earth should interest anyone who wants to know about life elsewhere and gain a fresh perspective on life at home which, if the authors are right, is even more precious than we may ever have imagined. Again, the evidence is more consistent with the Bible. As Edwin Hubble lamented, an atheistic philosophy offers the only escape from such a 'horrible' implication. Having established the legitimacy of the ‘galactocentric hypothesis’ we will now review observations that are consistent with, indeed suggestive of, that hypothesis; we begin with Hubble’s observations, already noted above. The assumption of uniformity has much to be said in its favour. If the distribution were not uniform, it would either increase with distance, or decrease. But we would not expect to find a distribution in which the density increases with distance, symmetrically in all directions. The apparent departures from uniformity in the World Picture are fully compensated by the minimum possible corrections for redshifts on any interpretation. No margin is left for a thinning out. The true distribution must either be uniform or increase outward, leaving the observer in a unique position. The departures from uniformity are positive; the numbers of nebulae increase faster than the volume of space through which they are scattered. Thus the density of the nebular distribution increases outwards, symmetrically in all directions, leaving the observer in a unique position. As seen above, this was the observation that horrified Edwin Hubble as it implies - absent additional hypotheses - that we occupy a unique, central position in the universe. Over the last few decades, new evidence has surfaced that restores man to a central place in God’s universe. Astronomers have confirmed that numerical values of galaxy redshifts are ‘quantized’, tending to fall into distinct groups. According to Hubble’s law, redshifts are proportional to the distances of the galaxies from us. Then it would be the distances themselves that fall into groups. That would mean the galaxies tend to be grouped into (conceptual) spherical shells concentric around our home galaxy, the Milky Way. The shells turn out to be on the order of a million light years apart. The groups of redshifts would be distinct from each other only if our viewing location is less than a million light years from the centre. The odds for the Earth having such a unique position in the cosmos by accident are less than one in a trillion. Since big bang theorists presuppose the cosmos has naturalistic origins and cannot have a unique centre, they have sought other explanations, without notable success so far. Thus, redshift quantization is evidence (1) against the big bang theory, and (2) for a galactocentric cosmology, such as one by Robert Gentry or the one in my book, Starlight and Time. 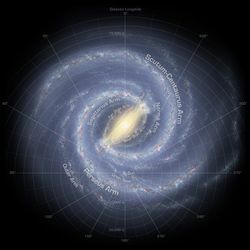 Newly published data from the Sloan Digital Sky Survey (SDSS), led by Max Tegmark of the University of Pennsylvania, shows that our galaxy is centred on a great concentric distribution of galaxies. The SDSS team has published a 2-D slice of the galaxy map on their website, showing about 67,000 galaxies that lie close to the Earth’s equatorial plane. The 2-D map looks like two slices of pizza, as the Milky Way Galaxy obscures the view for much of the mid-sky. Figure 1 shows one of these map wedges. The small dots, each representing a galaxy, appear to form into enormous concentric structures centred on the middle (or the tip of the pizza slice), where our galaxy is located. (The other wedge also shows concentric structures, though not as clearly). Furthermore, the density distribution of galaxies is generally decreasing with the distance from the centre, which is the opposite of what a big bang cosmology would predict. This recent SDSS map more clearly shows circular structures centred on our galaxy than do earlier maps. It is more than an artefact of the sampling technique because the density distribution of galaxies is expected to increase with distance in a big bang universe, as one looks back in time. In this map, the galaxy density seems to oscillate (decrease and increase periodically) with distance hence the circular structures. This spatial galaxy density variation therefore can only result from the fact that galaxies are preferentially found at certain discrete distances. The SDSS map. Note especially the top portion where the concentric rings are more apparent. A more colorful image of the SDSS map. Many assumptions have gone into the construction of this map, and as creationists, we would not agree that they are all justified. However, this new evidence is showing, on a very, very broad scale, something that creationists have believed for a long time. In particular, Russ Humphreys’ paper ‘Our galaxy is the centre of the universe, “quantized” red shifts show’, described this very sort of thing, even though the structure he was describing was of much finer detail. As Dr. Hartnett points out, the SDSS data provides independent support for Humphreys' contention that the earth is centered on a concentric series of 'shells of galaxies'. Dr. Hartnett presented these findings at the recent Crisis in Cosmology 2: Challenges to Consensus Cosmology and the Quest for a New Picture of the Universe conference (September 7-11, 2008). I presented the work I have done on large scale periodic structure of the universe as determined from the Sloan Digital Sky Survey (SDSS) and the 2 degree Field Galaxy Redshift Survey (2dF GRS). Eric Lerner commented that what I have shown them may be the largest single space structure ever discovered - billions of light-years across. I think it could well indicate that our galaxy is cosmologically near the centre of the physical universe - that we can see anyway. The Observational Approach to Cosmology by Edwin Hubble. Oxford University Press, 1937 in HTML format. The Observational Approach to Cosmology in .pdf format. More on the ‘Rotating Cosmos’! by D. Russell Humphreys: 1997 follow-up on 'New evidence for a rotating cosmos' article. Cosmology: A Singular Conundrum: How Odd Is Our Universe? by Adrian Cho. The Energy of Empty Space That Isn't Zero lecture by Lawrence Krauss. ↑ Our Galaxy is the Center of the Universe, ‘Quantized’ Redshifts Show, Journal of Creation 16(2):95–104, 2002, Dr. Russell Humphreys. See Section 7, "The cosmos is galactocentric". This page was last modified on 1 February 2015, at 20:43.